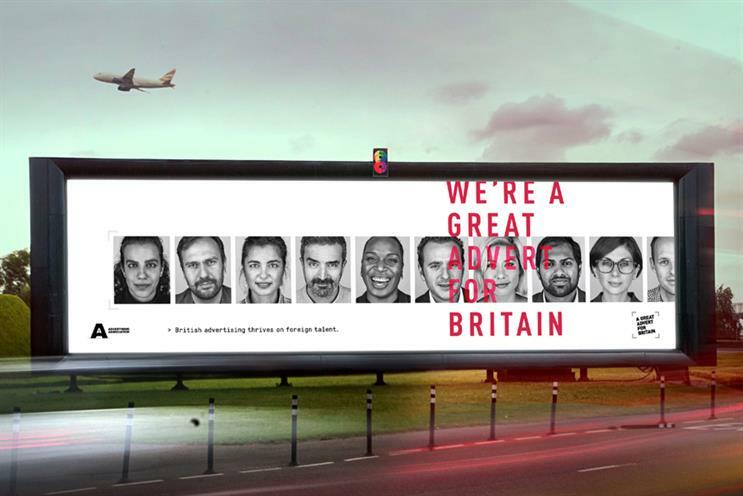 The Advertising Association has launched a campaign, called "A Great Advert For Britain", to celebrate the role of foreign workers in the ad industry and warn it is under threat because of Brexit. "The UK’s creative crown is in jeopardy," according to the AA, which has published a report, called World Class Talent, World Class Advertising, that shows London, in particular, attracts more foreign workers to its ad industry than New York, Paris or Amsterdam. James Murphy, group chief executive of Adam & Eve/DDB and chairman of the Advertising Association, said: "The UK ad industry is a world-leader because we’re open to the world. "It will be catastrophic to the long-term success of the sector if we can’t access the right talent quickly and easily." The AA’s report, the sixth in its Advertising Pays series, has been produced in partnership with LinkedIn and uses the networking website’s data to show 328,000 people work in UK advertising and marketing – roughly in line with the 350,000 previously estimated by Deloitte. About 43% work in London and 57% in the rest of the UK. "The proportion of the current advertising and marketing workforce in London that has migrated here from abroad in the last 12 months is three times higher than the corresponding figure in New York; and also higher than in Paris and Amsterdam," the AA said, citing LinkedIn data. "More than a third of this talent comes from within the EU, with many others arriving from the United States and Australia." Overall, 556 out of every 10,000 people on LinkedIn in London work in advertising. It is 503 in New York, 483 in Sydney, 427 in Paris and 418 Amsterdam. The report also found that the UK is "the number one source of international advertising and marketing talent" in New York, Paris and Amsterdam and has provided more than a third of recent migrants to Sydney’s advertising sector. The AA is urging the UK government to support the ad industry on immigration rules because freedom of movement of EU nationals is likely to be curbed after Brexit. Karen Bradley, the culture secretary, has given her support in the report. Stephen Woodford, chief executive of the AA, said the report showed immigration is "the most important area for government support to maintain the UK’s position as the world’s leading global advertising hub and drive growth domestically". Adam & Eve/DDB has made the ads, which feature portraits of a number of international executives working in the UK ad industry. "Staying open to our foreign colleagues – to their ideas, ingenuity and commitment – enriches us all," the ad copy says. "Let’s keep it that way." Among those who have been photographed for the ads are Severine Charbon, global chief talent officer for Publicis Media, Sherif Guindy, head of technology at Maxus Global, Jordi Bares, creative director at Framestore, Elorie Palmer, partnerships sales executive at Immediate Media, and Julia Boyle, designer at DDB Remedy. Other talent who features in the ads are Astrid Van Essen, managing director at MediaMonks UK, Benjamin Lickfett, head of technology and innovation at Diageo, Attilio Gianfresco, executive producer at Mindseye London, Stephane Richanie, communications executive at the Advertising Association, and Renuke Samarasinghe, associate director at Spark Foundry. Josh Graff, UK country manager at LinkedIn, said he hoped the AA’s report will "inform policy makers and educators on what’s required to ensure the [advertising] sector continues to thrive" after Brexit.